SHlKl: Well, I'll be changing to snap as soon as I can, this is one of the stupidest things I've ever seen a ISP do. All the sites and other services that are down, are either P2P or some form of downloading. Logically I would say that this is slingshot shaping our internet, maybe to do with the new unlimited no P2P plan they released. The worst part is their is no mention of this on their site and they even try to tell people that changing ISPs won't solve the problem (It did solve it for everyone I know that changed). Heres to 2 weeks of staying up to 5am and waking up at 7am to do my uni work because I can't do it when I get home at 4pm. I try to when I can lol, but sometimes I need to download something at 5pm, but have to wait to past midnight, finish my part of the project then upload it again before the next day. Slingshot lost themselves another customer. I just changed to snap and everything is working fine. Still down in Hamilton, 2 weeks later. Slingshot are refusing to terminate our contract and waive the disconnection fee, even though they haven't provided a decent service for 2 weeks. Do Slingshot have any sort of obligation to waive the fee, considering we can't do half the things we normally do online. They say it's because 'they haven't resolved the problem'. We're desperate to move to another provider, and they just don't get it that even if they do fix it, we'll be leaving as soon as our contract is up in 2 months anyway. 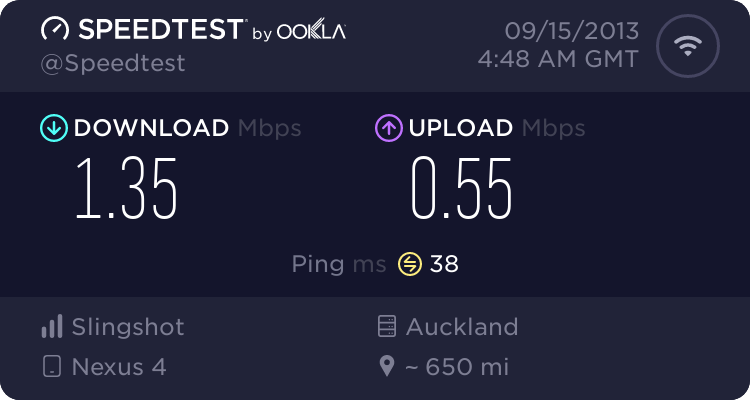 No doubt Slingshot will bill me for the early disconnection fee. I just won't pay it, and will politely explain why. If they resist, I will politely explain that they will need to recover the money in small claims court, and I will be talking to Fair Go, as I'm sick of being treated badly by ISPs, and I know a lot of other people are too. Btw, if Slingshot do push back, we should start gathering names of other disgruntled (ex-)customers. dont bother, you'll only be making things difficult for yourself. At the end of the day you signed a contract. Yes, the service may not be satisfactory at this stage, but if you don't raise your concerns first you have no right to dishonor the contract and expect no repercussion. It will go to debt collection first, and that is a pretty ugly road. Call them and dispute it with them now. It will be much easier for you later. If you decide to take it to small claims, remember Slingshot have everything on record and things might not go your way. I've already raised the issue with them, and logged a fault some days ago which has not been resolved. I'm not sure why you guys think there's only one party in a contract. Slingshot are the other party, and their duty in the contract was to provide a reasonable service. They did not. They dishonored it; not me. I am in Parnell, Auckland. I changed to Telecom VDSL. It was all put through last week, and all my problems have gone. 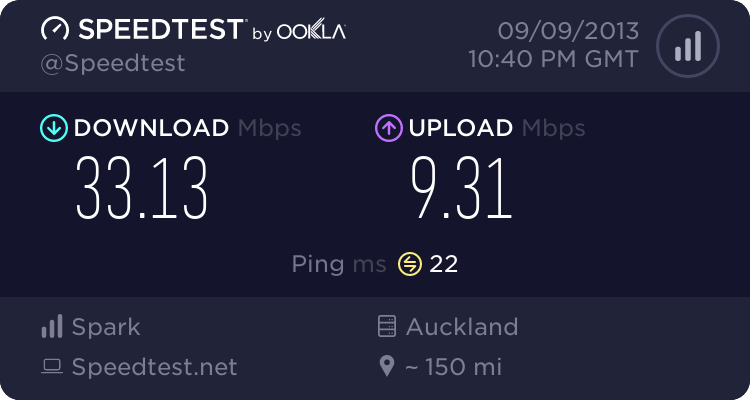 So, my speed is dramatically faster and stable, but I have a little less data, and am committed to 12 months with Telecom. 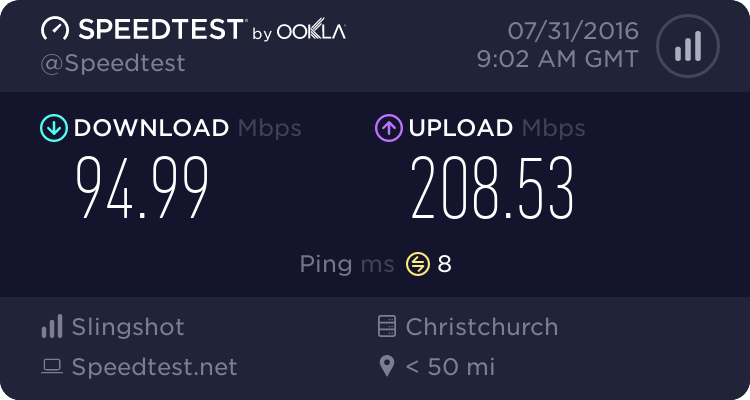 They installed a splitter and supplied the wireless VDSL modem at no extra cost. Bnonn: I've already raised the issue with them, and logged a fault some days ago which has not been resolved. If you are going to disputes tribunal you should take the lead as soon as Slingshot ask you for the ETF. Presume you asked them for a solution which appears to be transfer to EUBA. Can they provide you with this service, if not make sure you have something saying they cannot. the more written proof of your complaints of lack of service of acceptable quality and the more proof of their denying there is a problem or being unable to find a solution, the stronger your case will appear. Remember you are disputing the liability for the debt and not the amount. You would need to focus on the Consumer Guarantees Act, the gurantee of a service of 'acceptable quality' and that you offered them the chance to repair at first instance. 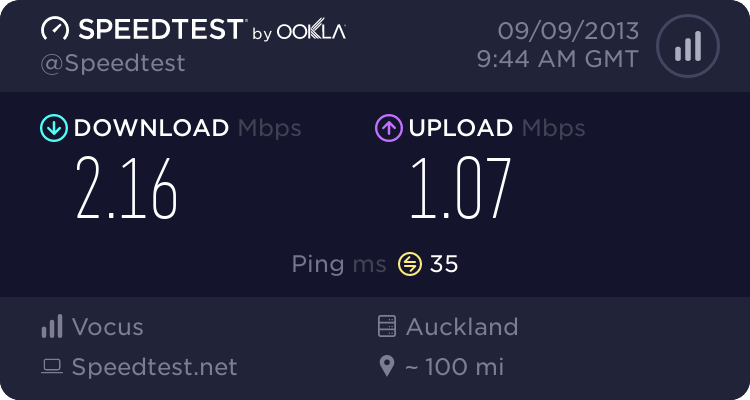 Given Consumer NZ have been in the media in the past couple of days about broadband fees, they might be worth talking to more directly on this issue. Good luck with it but remember at Disputes Tribunal they cannot have legal representation and neither can you, however it does not mean you cannot consult legal advice prior to your hearing on the issue at hand. My sister and her husband are both lawyers, but yeah, I'm quite happy to represent myself. I'd prefer it that way! Heck, I'd settle for a good bout of fisticuffs quite honestly. If Slingshot's CEO can beat me in a fair fight, I'll pay his early disconnection fee! its 12:25pm and I cant watch video from youtube. dont forget Acceptable and Reasonable are moveable targets. What may have been acceptable and reasonable a year ago (which is prehistoric in internet terms) may not be today. Hence previous decisions may need reconsideration. True, but it's hard to imagine that acceptable or reasonable means "unable to use important and common services between 4 pm and 12 am", given that other ISPs using BUBA are able to do that.